Kunst und Recht is hosted by Quotus publishing on behalf of Schleuen Verlag. The following instructions apply to all publications on our platform. For al full list of our titles visit the Quotus homepage. 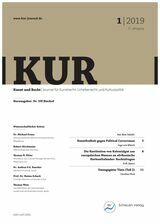 If you have already registered for an account for any one of Quotus’ journals, you can use that to administer also Kunst und Recht.